View Poll Results: Who will win the 2018 VASC? I read somewhere that Crusher was given Mr McLaughlin’s hemet in exchange for support in the early days of his career. Scott is a good guy but his early career was guided by others. Running a Pty Ltd company solely for the labour of one person is frowned upon in any case, and you'd wonder how badly it would reflect on someone if this actually got investigated. No it's not; in fact many years ago the minimum number of shareholders was reduced from 2 to 1 to facilitate situations such as that. Anyway, digging up reasons to try and divert attention from Scotty's and DJRTP's amazing and well-deserved 2018 championship win seems very petty. 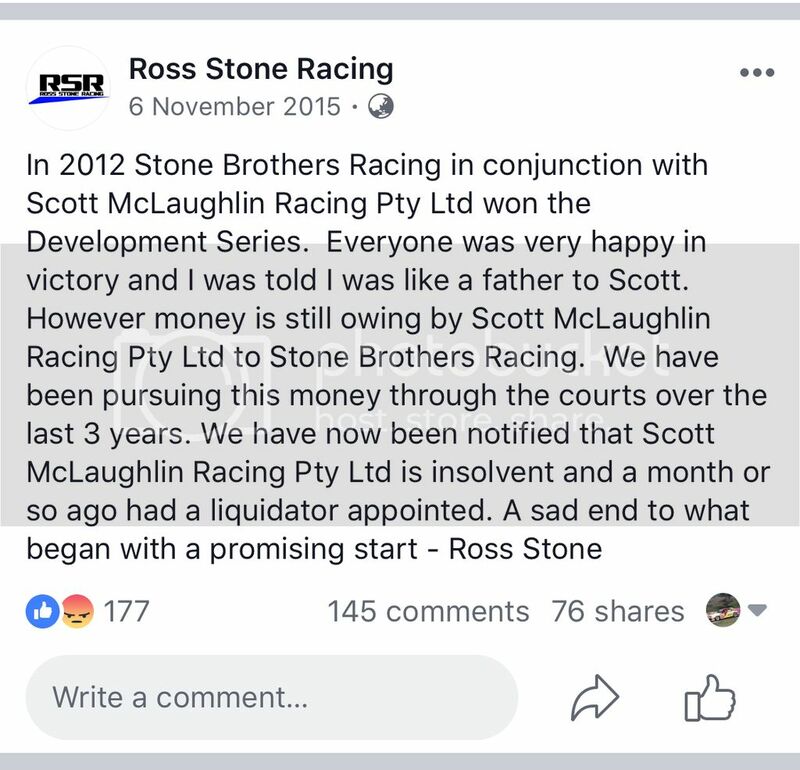 Wonder if Ross has preordered his copy of Scott’s book Road To Redemption? Not petty at all. We are speaking to the character of a driver who has now been named a Champion of the sport, and as such represents the sport as Champion in all his dealings in future. Wasn't it his old man that was ruling the roost? So you're saying champions are not allowed to have financial issues in a sport which is governed by, and consumes vast amounts of, money? If so, that's utterly ridiculous. You are either good for your word or you are not. It is kinda binary. I think most will be able to see through what is essentially a thinly-veiled dig at DJRTP. Again, quite petty; and remembering too they're one of only two teams to have broken through the 888 championship dominance of the last decade; and they've done that twice now. Credit where credit is due should be the approach here. ‘Most’ would be wrong, as you seem to be.. If DJRTP were the shining light you think they are, with this mess still hanging around they would tell Scotty to get it sorted out asap and put it to bed. It's not like they can't russle up some funds in the unlikely event Scotty is a bit short. Which marketing guru came up with the global city moniker? Given that screenshot above was dated as 2015, who knows if it was ever resolved?